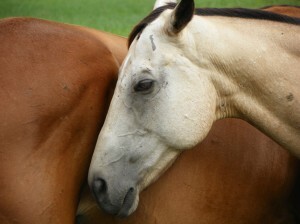 Equine Therapy creates real-life situations in which individuals must learn to develop and integrate life-skills. I use the horses in many different ways. In my work with horses I allow for organic influence. Most of the time the horses intuitively know what to do and so does the client; I am there to help guide the experience. I have always had horses in my life, and I believe that they are very powerful and intuitive creatures. I have had many influential therapeutic and personal experiences with horses, and profoundly believe in their ability to teach us about connection and balance. Riding is one of the many ways to explore this feeling of connection and balance. It can help us feel supported during challenging times, and can help increase self-esteem and confidence. It also helps with basic motor control, trunk control and building major muscle groups. There are many different ways to be with the horse. It is not only about riding and technique; it is also about fostering relationships. I often do groundwork with horses, enabling clients to experiment with their boundaries, use their voice, and step into their power. I also do herd work, and reference hierarchies and family systems. As the therapist, I maintain the safety of the interaction while helping to guide the client towards increased capacity for contact, trust, boundaries, and self-regulation. I have the ability to balance compassion with a practical eye for enacting change.